As you plan for a catastrophic event for you and your family, pet food storage is important for those who consider their pets as part of the family. Similar to human food storage, canned pet food, freeze-dried pet food even making and canning your own are all alternatives. The species of pet will determine how elaborate your plans need to be as cats are notoriously self sufficient but other pets, such as birds, dogs and reptiles, often need more assistance. You should try to gather about a full year supply of pet food and rotate your purchases. You can buy extra bags or cans of food each time you go shopping, but always open the oldest container of food to avoid going over the expiration date. 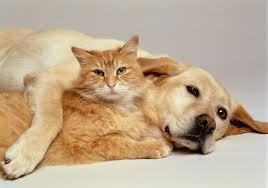 This way, if the pet food supply chain is disrupted temporarily, you have an adequate pet food storage supply. Pet food companies seal their food effectively so the best storage of dry kibble is in the original packaging. You can protect the bags from punctures and tears by placing them in plastic or metal bins, but once you open the bags it is best to protect the food from oxidation. Amazon.com carriers a variety of airtight pet food storage bins such as the 55-quart Iris Premium Airtight Container or the Gamma2 Vittles vault that holds 15 to 20 pounds of food. Dry dog food usually has a very high fat content, which becomes rancid over time. Usually the food at the top of the container begins first and turns white, but if you have fish you can feed them the food that has turned. Bags of food are dated with "best used by" warnings and you should pay attention to the dates or you can stockpile the 10 year shelf life Long Term Emergency Storage Dog or Cat Food Supply for about $110 per 30 pound bag for dogs or $80 for 18 pounds for cats. Freeze dried pet food is available on Amazon.com and it has a long shelf life and is easy to move and carry. The commercially prepared freeze dried food is often premium quality food at a premium price. Green Bay Pet Food sells its freeze-dried beef nibblets for about $13 for a four-ounce package. Stella and Chewy's Freeze Dried foods has a list price of about $32 for a 16 ounce bag and the package warns the food should be discarded if it isn't eaten within a half hour. Canned food can be stored fairly easily, it takes up less room for pet food storage than dry food and it has a long shelf life. You can always add to the ready-made pet foods by mixing in vegetables & table scraps to make the bags and cans of pet food last longer. You should avoid adding chocolate, onions, grapes and apple cores, as they are poisonous to dogs and cats. Having a reserve of commercial food is a plan for short-term catastrophic events but when a long-term disruption occurs you need a back up plan for your pet food storage. Some dog and cat breeders maintain that feeding raw meats is the healthiest way to go with pets. If you are raising chickens, in particular, feeding the pets uncooked chicken bones and the parts of the chicken you don't eat is a possibility. You may need to secure your chickens from your cats and dogs, and to discourage them helping themselves to your poultry. If you currently butcher your own meat, making and canning your pet food is an option. You can use the parts of the animal that may not entertain your taste such as the liver, brain or kidney, add some carrots, beans and spices and follow the same canning procedures that you would use for humans. If you season the food, it may smell as inviting as regular human food, which depending on desperate times, it might be a last option for human consumption. Space is always a factor for any kind of storage, so some preppers plan for their pets to eat whatever they are eating, which eliminates the need for additional pet food storage space. This plan requires that you stock additional provisions for your animals but it does eliminate the need to stockpile bags or cans of pet food in your shelter. The best plan is being prepared to provide enough provisions to sustain those lives that are most important to you, which is likely to include your pets.